PlasmaBlast Games is a small company from Greece, operated by Marios Damoulianos. 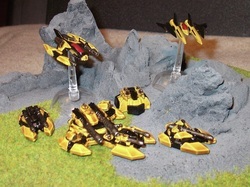 PlasmaBlast Games specializes in 6mm sci-fi models, as they're one of the newest 6mm sci-fi model companies out there. PlasmaBlast Models also takes a different approach to model creation. The majority of the models in the line so far are created from 3D computer imagery. This is a growing trend too, because it's a lot easier to whip up something in a 3D software program, than it can be to pay a traditional sculptor. It also gives the owner more control over the design, as all of the 3D models in the PlasmaBlast line were created by Marios himself. The only exception are the infantry models which were sculpted by Michael Lovejoy. There's two different armies to choose from in the PlasmaBlast Games lineup Progenitor and Orbital Combine. While there's no actual game yet in place designed specifically for these models, there is a couple of army lists available created by Peter Jones from Specialist Military Publishing for the Future War Commander ruleset. These can be downloaded from the PlasmaBlast Games website for free. However Marios does have some fiction in place describing every single model in detail, and even some fiction describing the world in which these two forces exist. These aren't available to the public just yet, but I was given a little preview, and by the look of things I have a notion that he'll be creating his own game for the models eventually. There's two aircraft available in the lineup which I think are topnotch. The Bantam - Multirole Fighter really reminds me more of a sleeker sci-fi take on the Batplane. It's a single piece model, which comes with a clear plastic flying 25mm hex base and sells for 2 Euro/$2.70 USD. The Dralke - Heavy Attack Aircraft is another amazing model, and it reminds me totally of a Privateer/Smuggler class Vaksai fighter from the Star Wars Galaxies MMOG. It too sells for 2 Euro/$2.70 USD, and also comes with the same clear 25mm plastic hex flight base. Both models clean up nice, and were a lot of fun to paint. In the way of heavy tanks the Gammaran is really slick looking. Actually I like the lines and shape of all of these models a lot. They're quite similar across the board, which makes for a really uniform looking force on the tabletop. The Gammaran comes with one of three different turrets, which you can select from a pulldown menu at the PlasmaBlast Games webshop. The turret options offered include a dual barrel plasma cannon, plasma cannon w/missile pods and what Marios called the Plasma Destructor variant. That just sounds wicked mean doesn't it? The Gammaran no matter which variant you choose will set you back 2 Euro/2.70 USD. It's also a two piece model, with the tank body and turret as two separate pieces. Clean up is a cakewalk, because mold lines are almost non existent. All you need to do is place the turret on top and paint away. The Jagon Medium Grav Tank is noticeably smaller than the Gammaran. You can tell it's the smaller sibling of the Gammaran tho, because the resemblance is so spot on. It has a smaller turret as well, and it looks like a really cool sci-fi tank too, but at 1.7 Euro/$2.30 USD I think the Gammaran is the better value of the two. The Nizzlebat Light Grav Tank is also wee small. Again, I think the design is really amazing, but at 1.20 Euro/$1.60 USD I'm just not seeing any value in this model. There's literally 25-cents USD worth of metal sitting there, it's just too expensive at the asking price. The Tardiss Grav Tank is a model which is essentially the same body, with a variety of different options. There's the Zickel UCAV & Tardiss Grav Tank combo, which is the chassis, plus a little ladder looking piece for the unmanned combat aircraft vehicle to sit upon when it's not in flight. The little UCAV looks like a wee tiny version of the F117 Stealth Fighter. It also comes with a clear plastic 25mm flying hex base to set the UCAV on when it's in flight. That combo will set you back 2 Euro/$2.70 USD, which isn't too bad considering it's really two models in one. The other Tardiss variants come with a missile launcher turret, or some odd looking Multispectral Sensor array that sets where a turret would. These other two versions are 1.70 Euro/$2.30 USD, which I think is a bit much. The Corbus - Static Defence Turret is rather cool looking. It's a stand alone turret, and comes with the same missile launcher turret as the Tardiss has. It will set you back 1.70 Euro/$2.30 USD, which is pushing it, but it is a really nice piece. The Zargon APC is another model that clearly is based on the Tardiss chassis, but is their version of an APC. It's just not a model that I like very much, and it's probably the worst model of the entire Orbital Combine line. It's just uninspiring, I also can't see paying 1.20 Euro/$1.70 USD for it either. It does however fit in nicely with all the rest, because as I've said before the good thing about the entire army is that there's a very uniform look about the entire Orbital Combine force. The War Synthetics Infantry and Drazzar Elite Infantry are two small sets of infantry models that I really like. The War Synthetics come as a six model set, with 2x of the larger flyer looking guys, and 4x of the infantry on foot fellas. The flyer guy reminds me a lot of the Warhammer 40k Necron Destroyers. Actually if I didn't know any better, that's what I'd think it was. The other little fellas on foot are armored up nice, and have a unique sci-fi look that matches the helmet and armor of the flyer guy. The Drazzar Elite Infantry is also a six piece set, with 2x guys with missile launchers on his shoulders, which looks a lot like a BattleTech BattleArmor guy, and 4x guys with what looks like bazookas or some sort of other heavy weapon on their shoulders. Both infantry sets some on a single sprue, and cost just .95 Euro/$1.30 USD. I still think that's a bit on the expensive end of the spectrum, but those infantry models are exceptionally nice. There's one last piece that isn't yet up for sale on their website, but I was sent this model for review. It's called the Valgaross, and it's the super heavy tank for the Orbital Combine. This thing is huge, and it comes with a main body, two small missile launcher turrets, a big main gun, and a smaller front turret. Once assembled and painted up, it's a really amazing model to behold. It's a hovering super fortress of weaponry. The Valgaross is priced at 8 Euro/$11 USD. There's two different aircraft for the Progenitor faction. The first resembles a VTOL from the older Command & Conquer PC RTS games called Shadowasp - Heavy Attack Hoverjet. At 2 Euro/$2.70 USD it also comes with a clear flying hex base, which is a nice touch. Next the Eaglebane - Multi-Role Fighter looks like a hybrid modern day stealth advanced tactical fighter/sci-fi aerotech plane. It too is priced at 2 Euro/$2.70 USD and also comes with a clear flying hex base. Of the two flying models I like the Eaglebane the best. The Hammerhead heavy tank has more of a traditional armored tank look and feel to it. I like the lines in the side plates too. It comes as a Tank Destroyer or as a Multi-Role variant. The Tank Destroyer version has a dual barrel mounted turret, while the Multi-Role version is a larger single barrel turret. Both look great, and of all the tanks from both lines, I think I like this one the best over all. It's also priced at 2 Euro/$2.70 USD each. The medium tank for the Progenitor is the Barracuda. It comes one of five different ways, by offering five unique turret options. There's Tank Destroyer (a traditional tank turret), Infantry Support (looks like a flamer turret), Heavy Missile Variant (Missile launcher turret), Artillery Variant (a huge raised artillery gun mounted turret) and the Multi-Sensor Array Variant (a big radar dish where the turret goes). Either option will cost you 1.7 Euro/$2.30 USD. The Wolfbite 3x3 Missile Trike is a unique little vehicle. It's a three wheeled vehicle with missile launchers on each side of the rear of the chassis. Visually speaking it's a nice looking little warmachine. However it's very very tiny. It sells for 1 Euro/$1.40 USD, which isn't much, but it's so small that it's hard to justify even that much for it. The Spiderblade Light Assault Tank, is as the name implies, the little brother to the Barracuda. This model also comes in all of the same variants as the Barracuda, and the only thing different about it is the chassis. Otherwise it uses the same exact turret options. It looks very much like the Barracuda chassis too, only in the front there's less armor plating, so the treads are showing more than the do on the Barracuda. So there's a tiny bit less metal used on Spiderblade. Any of the variants (Tank Destroyer, Infantry Support, Heavy Missile Variant, Artillery Variant and Multi-Sensor Array Variant) cost 1.7 Euro/2.30 USD, the same price as the Barracuda models. They have their own defensive turret too called the Styx - Static Defence Turret. It uses a large barreled gun positioned on top of a cylinder-shaped base. I can't say that I like or dislike it, because it's different looking. The turret has a big gauss cannon with dual missile launchers to each side of the gun. It's priced at 1.7 Euro/$2.30 USD. To carry troops about they also have the Gecko - Armored Personnel Carrier. Of the two factions this one looks much better too. It reminds me of a sci-fi Striker vehicle. It's really tiny too, and it's priced at 1.3 Euro/$1.70 USD. Lastly there's two infantry options for the Progenitor faction the Progenitor Light Infantry and Progenitor Heavy Infantry. The Light Infantry come as 2x missile launcher guy and 4x armed with rifles, and the Heavy Infantry come as slightly more armored guys, 2x with a shoulder mounted weapon, and 4x carrying what look like a weapon mounted to the underside of the right forearm ( a mini-gun maybe?). They're so small that it's really hard to make out just what they're armed with. They're priced the same as the Orbital Combine models at .95 Euro/$1.30 USD, and at that price you get 6x models total per set. Last but certainly not least is the super heavy tank for the Progenitor faction called the Tigerclaw. This is also not yet available through their website, but by the time you read this Marios should have it ready to order I'm told. It's a multiple piece model, as there's two small turrets for the right and left side of the center of the chassis, a flat missile launcher-looking turret for the front of the chassis, and a monster dual barrel turret to top if off. This is a behemoth of a tank, and staying true to form with the rest of the Progenitor models, it too is a tracked and heavily armored vehicle. Honestly, it's hard to say which super heavy is nicer, because the Tigerclaw is easily as nice as the Valgaross. It too is 8 Euro/$11 USD, and as heavy as these models are, I'd say they're worth it. Overall I like the majority of the stuff from PlasmaBlast Games. There's a few models which I simply don't like, but out of the 10x different models per side (not counting variants) it's hard not to like most of them. I like the look and feel of the hover-driven Orbital Combine a bit more than the traditional armored company look and feel of the Progenitor, but there's a few pieces that really stand out from the Progenitor side too. It's really hard to say which of the Super Heavy Tanks I like the best, because they're both so nice. The same is true of the models in the Heavy Tanks category, there's no looser on either side in that department either. The Aircraft are also quite nice on both sides. It's when it comes to the tiny tiny models that it starts to be a hard choice, because as tiny as some models are, you have to say to yourself is that model really worth $1.50/$2USD per model? I'm not yet an expert on 6mm scale models either, but cost-wise from what I've seen some of the PlasmaBlast Games models just seem a little on the expensive side too. Although in their defense, the cost of Tin is on the rise and many companies have already announced price hikes to take this into account. So if they don't raise their prices any more than what they are, then I think they'll do quite well. Even if some are a little higher than what I'd feel comfortable paying, they all look really nice, and have a unique look and feel that keep them uniform within their own respective factions too. Personally I think they look great with BattleTech models, and I'd imagine they'd fit in really nice with CAV as well since the new CAV scale is said to be 8mm, which is pretty much what most can call “6mm Heroic Scale”. 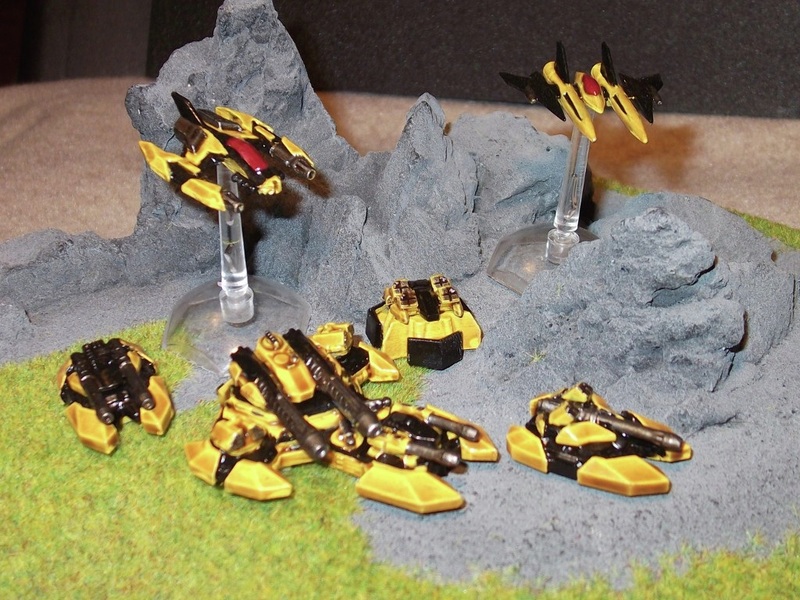 Some of the PlasmaBlast stuff can actually be a cheaper alternative to some of the Iron Wind Metals vehicle models, so they make great proxies for some of the BattleTech vehicles. WarGameGuru - Tell me about PlasmaBlast Games and how it all began? Marios - The story begins about 15 years ago when I first saw some SPACE MARINE 6mm sci-fi miniatures for the first time. I was hooked immediately. I just loved them and I collected and fought with those tiny tanks and infantry for some time. When the internet arrived some years later I discovered lots of independent 6mm miniature manufacturers and I was glad to see the diversity of the minitures on offer. One day I learned about 3D prototyping and then I realized that with a 3D design program (and lots of time and money to throw away) I could produce the miniatures that I really liked and above all find a way to express my love for sci-fi and miniature wargaming. So I started slowly learning and designing, I produced some 3D prints then some more and I went on from there. I took it easy, but it needed a lot more work than initially seemed necessary and at the end it took me about 2 years to put those designs together and produce the results you see. Thankfully the miniatures have been well-received by the 6mm sci-fi wargame community and I’m really happy about that. WarGameguru - Why 6mm sci-fi and not 15mm sci-fi, or 28mm sci-fi? Marios - I chose 6mm for two reasons: Firstly because I really love the scale, having whole companies of armor and huge war machines battling it out on a gaming table is the only thing that really gives me that tactical “kick”, the feeling that something big is going on. Secondly, I felt that 6mm was also more “manageable” for an inexperienced 3D designer. As far as the other scales are concerned, I also like them, and I hope I can bring some of my designs to them at some point but these are more infantry-heavy and infantry is more difficult to design in 3D. I will need to expand my knowledge and invest in other 3D programs apart from the ones I use now so this will not happen anywhere soon enough given the other projects running currently for Plasmablast Games. WarGameGuru - Is there a big cost savings on creating models through 3D computer design, or do you employ this method because it gives you more freedom to create the models yourself? Marios - In retrospect, the money I spent just to get familiar with the various 3D printing methods and their peculiarities was such that the whole project would probably have come cheaper if I had hired a sculptor, but then it would be a totally different project. The creative part of it was the deciding factor, I simply love designing sci-fi war contraptions and I wanted to keep the design part to myself. So, since a computer mouse requires much less skill than a sculptor’s tools the choice was really easy. Marios - The fiction behind those lines is more like a base-line of ideas, a place to start from and grow. Before any of it sees the light of day, I will expand it and add more depth, detail and character to the races, introduce some important personalities and set the foundations for a third race. This aspect of the project calls for writing ability –in the writer’s sense- and I’d like to do it in a more organized and relaxed way than my current obligations allow for. So, it’ll definitely get published, but this will happen when the material has matured to a point of me being satisfied with it. together a model for it? What comes first the model or the fiction? Marios - This is a very interesting question, I ‘ll answer as best as I can. I think that firstly I decide very generally on the general aesthetic of the line like “tracks or hover”, “sleek or wobbly”, “unified or separate volumes” etc. This happens in tandem with coming up with the basic fictional technology behind it since “form follows function and vice versa”. After that, I move to specifically defining the aesthetic concept of the line, usually by working on a single model until I am satisfied with the results. This is not a straightforward concept-to-realization process but rather a long and sometimes arduous exploration around the central idea. The initial Orbital Combine designs were laughable –atrocious even!- although revolving around the same principles that lie behind the current designs which I can say I am really proud of. After the line gets its aesthetic set in a specific way, its expansion becomes an exercise in scaling and transforming shapes while at the same time keeping the same visual feel. At that point I will need to think about the general way the race fights so I design its vehicles and aircraft around that concept. Of course, the technological fiction behind the design remains a constant consideration, especially since I do not like “unrealistic” science fiction –meaning designs that obviously defy basic laws of physics or other universal practical principles. So, in a single sentence, I would answer the question by saying that model design comes first but not in an absolute way: the fiction is there from the start and remains there either as a resource or a constraint. Marios - I actually haven’t decided on this yet although I’ve put a fair amount of thought into it. For the next race I will probably move somewhere in-between, maybe one that lacks hover ability but looks more advanced -or at least “fictious” than the Progenitors. This is something that has to be explored, thankfully a process I always like a lot. Also, I hope I will be able to release an “organic” alien race at some point, which will be my own take on the “bug” theme. WarGameGuru - Are there any plans to create walkers or Mecha-like models as well? Marios - Walkers are really fascinating when it comes to design since they are usually reminiscent of humans or animals, thus much more able to stir our emotions than other war machines. However since I like to take into account the credibility of the fiction in question, I have some reservations as to their possible effectiveness as instruments of war since the dispersion of volume to limbs plus all those joints –weak spots- mean that from a protection aspect they would always be at a disadvantage when compared to more robust conventional tanks of the same weight. Of course this is a really lengthy conversation, and there isn’t a really absolute way to give a conclusion, especially since fiction is involved so since this is just gaming and walkers appeal to me so much (and I admit being a fan of battletech) at some point I may well put these reservations aside and just get on with the designing. sci-fi rulesets are available that your models work well with, if any? Marios - The miniatures are designed to be “generic” when it comes to rules, meaning that if a ruleset has a facility to allow for vehicle design, then it should be easy to create the attributes for them. Dirstside II is a good example of that, the miniatures are easy to integrate with it. Apart from Future War Commander and Dirtside II there is a soon to be released set, “Strike Legion” by Karl Johnson, which will have integrated support for the Plasmablast miniatures from the start. The set is very detailed as well as full of material and revolves around a very fresh central gaming idea so I have hopes that it will blow some fresh air into the 6mm rules choices available. Also, at some point I will release army lists for a well known 6mm ruleset which I would not like to name here, I’ll just say that it is the one –in its back version- that started it all for me 15 years ago, and this will be something like a tribute to it and all the fun I’ve had with it in the past. WarGameGuru - Is the overall plan to create your own game from the models you produce, if so when? Marios - Actually I have been brainstorming, play-testing and then again brainstorming for a 6mm ruleset of my own for more than 2 years now (on a lazy basis admittedly but this is another story). Game design is an art in itself, it is almost like engineering: You take various components and try to make them operate seamlessly with each other while at the same time on a higher level keep as close to the initial goals set for the game. The ultimate goal is the creation of a robust, relatively simple game system that finds a good balance between the abstract and the specific and elevates the game above the status of being a simple weapons delivery system. To me, this means giving the players serious command & control considerations, taking into account the morale and quality of the troops and bringing information & E/M warfare to the foreground which I feel is being neglected by most rulesets currently out there. Another goal with this set is to differentiate the vehicles not only on the usual armor, weapons & speed departments but also give them other advantages and disadvantages like their ability to react timely to threats or withstand fire without becoming suppressed. This way light and heavy units will have distinct traits which will help -or condemn- them in certain battle situations, thus making their choice and tactical usage a more serious matter than before. In all, the development of this game although pretty arduous is a very interesting process and I hope the end result will be satisfactory for everyone.